Tarot Deck Progress Report and Giveaway! Of course, since I was busy traveling and then finishing up the tarot project, I hadn't gotten around to doing much promo for the book yet. Oops. So I'm going to do this groovy giveaway (as well as one over on Goodreads, which should go live later today or tomorrow), and hoping that y'all will help me to spread the word. Pretty please? Can I get a "woot"!? Don't forget to go to Goodreads and add the book to your "To be read" list, and if you DO read it, I'd love it if you could put up a review as soon as you can, so everyone else knows how fab the book is. And now...the GIVEAWAY! This one is open to everyone (no matter what country), so all of my lovely distant readers can have a chance too. As usual, you get points for leaving a comment here and extra extra points for buying the book, but you don't have to do either. I'm giving away a signed copy of the book (and whatever other goodies I feel like throwing in when I get ready to mail it). The giveaway ends at midnight on 3/2/15, so enter right away! Thanks in advance for helping me to spread the word. 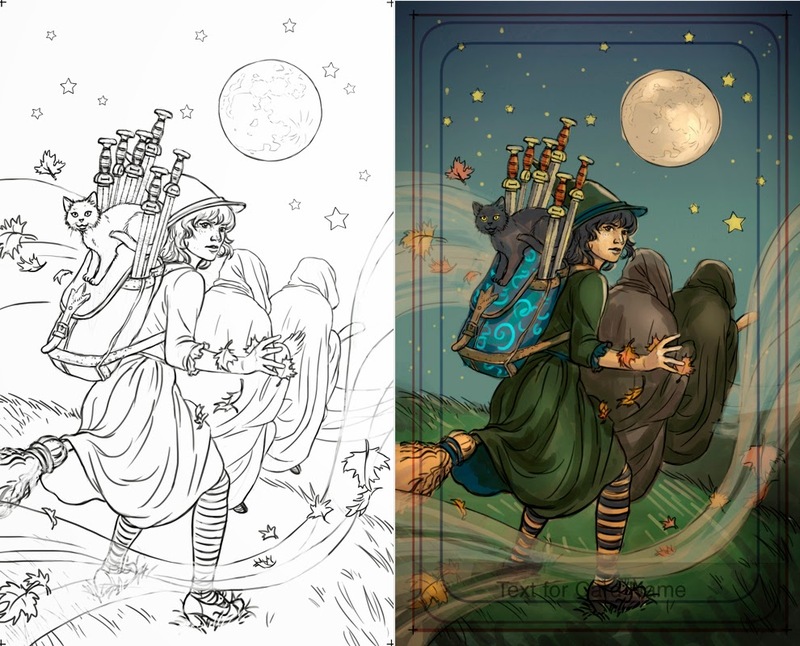 As some of you know, I have been working on a tarot deck for Llewellyn, along with illustrator Elisabeth Alba. (Who rocks. Seriously.) And I am happy to say that I just finished my part of the project, which included coming up with the theme, descriptions for Elisabeth to work from, and writing the book that will go with the actual deck. BOOYAH! Of course, Elisabeth's part will take a lot longer, since she has to do 78 cards in multiple stages. So don't expect to see this deck any time before next year, late-ish. In the meanwhile, though, this seemed like a perfect time to give you an update on our progress, and a sneak peek into how the process works. Plus, of course, a giveaway, to celebrate my finishing the book! Deborah: Elisabeth and I have been hard at work on the tarot deck for Llewellyn – me writing the descriptions and book that goes along with the deck, and Elisabeth illustrating. We thought it would be fun to make some blog posts dedicated to the process, showing how I begin by writing a description, to Elisabeth's final painted result. It's taken us a while to get to writing this, because we've just been so busy working on the deck! 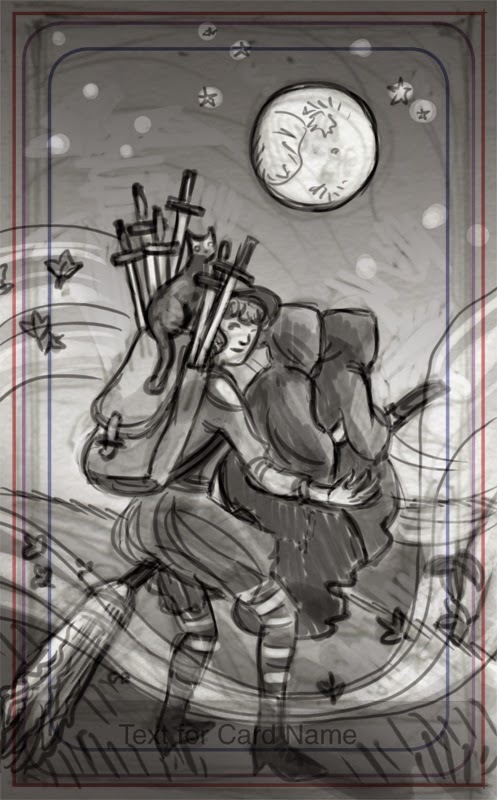 We begin with the final painting for the Six of Swords. 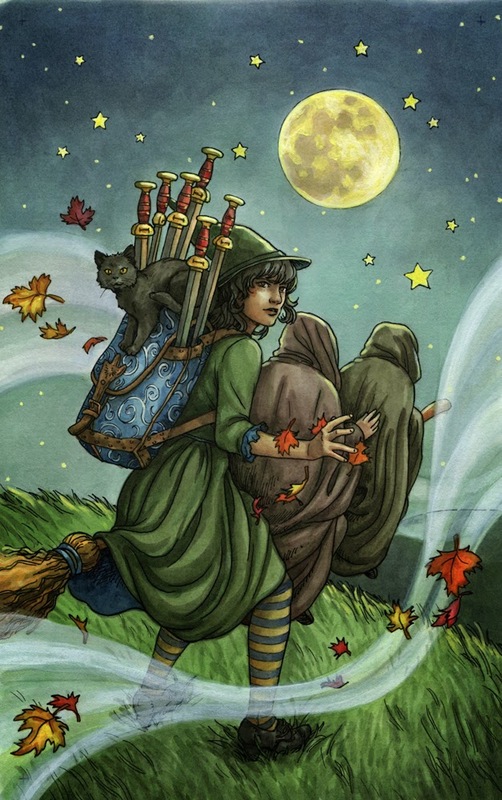 Picture: A black-haired witch is getting ready to fly off on her broom, two hooded shapes perched on the broom in front of her. A blue backpack with silver swirls on it sits on her back with six swords sticking out of it, a small black cat is perched on top. The full moon shines overhead. She is making an arcane gesture to summon up the wind. The mood is urgent, and a little dark, but also hopeful. Deborah: Here’s how I arrive at the picture descriptions, in case you were wondering (and of course you were). I have been reading tarot using the Rider-Waite deck for many years, and this deck is based on the 78 cards that are in that classic. So for each card, I would look at the original (as well as a few variations, including Barbara Moore’s fabulous Steampunk Tarot, to see how other people had done theirs). 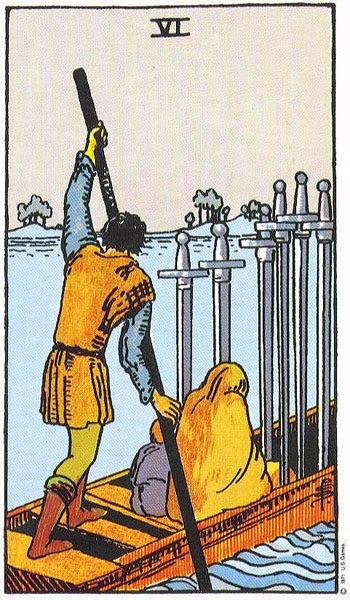 Then I’d consider how I usually interpret the cards when I do a reading, which often varies from the traditional definitions. 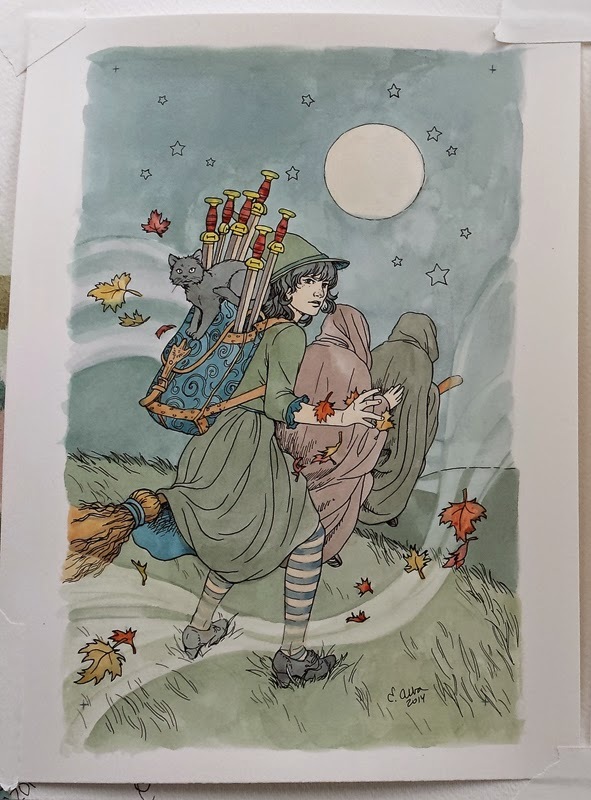 After that, I’d consider how my interpretation would look in the retro witch style we were using, which includes lots of witches in black hats, with brooms, black cats, and some fairy tale elements. From that I would “visualize” the card, and then try my best to translate that vision into instructions for Elisabeth. Elisabeth: After reading over the descriptions, I begin drawing small 'thumbnail' sketches to work out the composition with all the needed elements. I usually do them in pencil first. Elisabeth: Then I scan then and put them in the card template on Photoshop and make a better, but still rough, sketch there. This is what I first show Deborah; the art director, Lynne Menturweck; and the acquisitions editor, Barbara Moore. Deborah: Sometimes (usually, in fact) the sketch was perfect from the very first. Other times, there might be small details that didn’t match up with what I’d had in mind, and Elisabeth and I would email back and forth until we’d gotten the changes ironed out to both of our satisfaction. Thankfully, our visions for the deck line up very well, and we’ve never had a problem coming to an agreement on the best possible arrangement. Elisabeth: If all is well in the sketch, I take photo reference! My husband Scott (he's also an illustrator) and I have accumulated a lot of costumes that are great for posing in, though the only costume part visible in this photo is the white skirt. For other cards, I've used tunics, leather armor, medieval leather belts, cloaks, and even a sharp battle-ready sword. Then I work on the finished drawing, using the reference. Sometimes I draw the figures with pencil and scan them and place them in the sketch digitally. Other times I just draw them entirely digitally with my tablet. This one was drawn digitally. I also do a rough digital color version at this point, so I can figure out how I'd like to paint it. 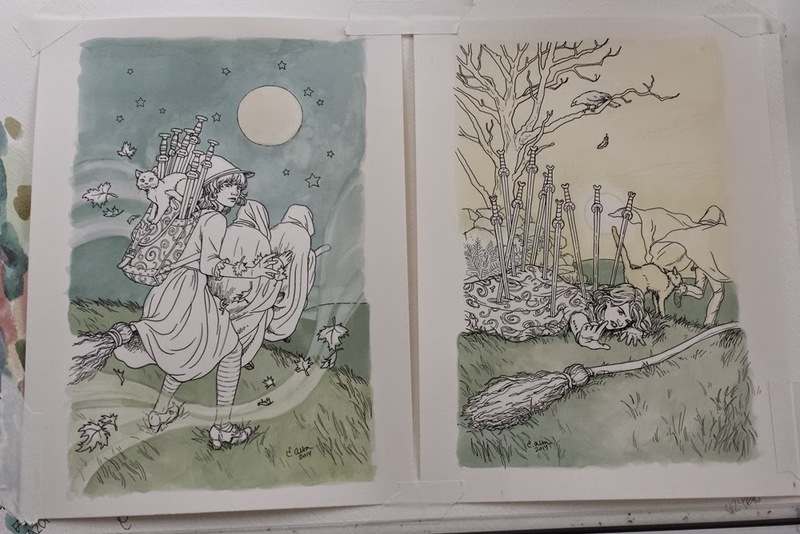 I sent the drawing in for approval and everyone agreed that the figures in front of the witch were too blob-like (the color version above shows their unedited appearance), so I made a hand visible and the tips of their boots, which helped immensely. I then print the drawing lightly on watercolor paper. I ink the drawing with a dip pen and black ink (Dr. Ph. Martin's Black Star matte ink - super waterproof, strong black, flows nicely). Then I start painting! I paint with Dr. Ph. Martin's Hydrus watercolor inks. Very saturated colors, and I can get darker than I would with tube watercolor. They are a little harder to work with though because they are not reworkable. Once it's on the paper, you can't take it off. I also used gouache to get more opaque in the moon and stars. 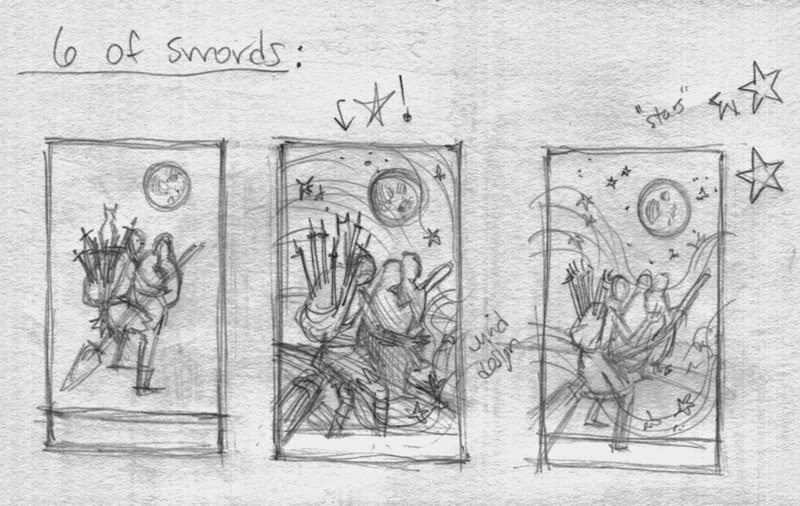 Here it is, inked, paint started, next to the Ten of Swords which I was painting at the same time. Base colors down... Note - the colors are off from the original because I was using my phone camera and didn't bother to color correct! Sometimes you just have to get gone. Try not to take your troubles with you. This witch isn’t going to spend one more minute where she is. She’s already on her way, with only a few necessities, because time is of the essence and sometimes it is better to get out with nothing than to hang on to things or people that are weighing you down. But she’s not traveling alone. It isn’t clear if she is helping her traveling companions or if they are helping her, but either way, they are in this together. An arcane gesture to summon the wind, and they’re off into an unknown future. All she knows is that anyplace will be better than whatever it is she’s leaving behind. And now for the giveaway!!!! All you have to do to enter is leave a comment. Tell me if you have ever used tarot cards either for fun or for serious fortune telling, or if you just like the pretty pictures. Are you looking forward to this deck? Planning to buy it when it comes out? Want more progress reports on other cards? Inquiring minds want to know. This contest is open to everyone and will run until Friday 27th at noon EST. The lucky winner will have until the following Friday to contact me, and let me know where to send the prize. No purchase is necessary. Greetings from the depths of cold and snowy upstate New York! I hope that those of you in colder climes are managing to make it through this unrelenting winter. Hopefully my news will brighten up your day a little (it sure brightened up mine!). I know that many have you been waiting to hear whether or not Berkley was going to give me a contract for the next Baba Yaga book. It took them quite a while to decide and I’m sorry to tell you that after looking at all the numbers, they have decided not to do book 3. In, fact, they have contracted for THREE MORE BOOKS IN THE SERIES—books 3, 4, and 5!! Plus another novella, which will be out before the next book. [Insert author happy dance here.] I hope this news makes you as happy as it does me. Which is pretty darned happy, I gotta tell you. The bad news is that since it took them so long to decide to contract for the next three books (did I say YAY? ), the third Baba book won’t be out until sometime around February of 2016. The novella (which will revisit our first Baba Yaga, Barbara, so we can see how things are going for her and Liam and little Babs) would be out around January, but that still means that all my faithful readers will have to wait a year or so for more Baba Yaga stories. I know; it’s a bummer. But wait—there’s MORE good news! Yes, really. 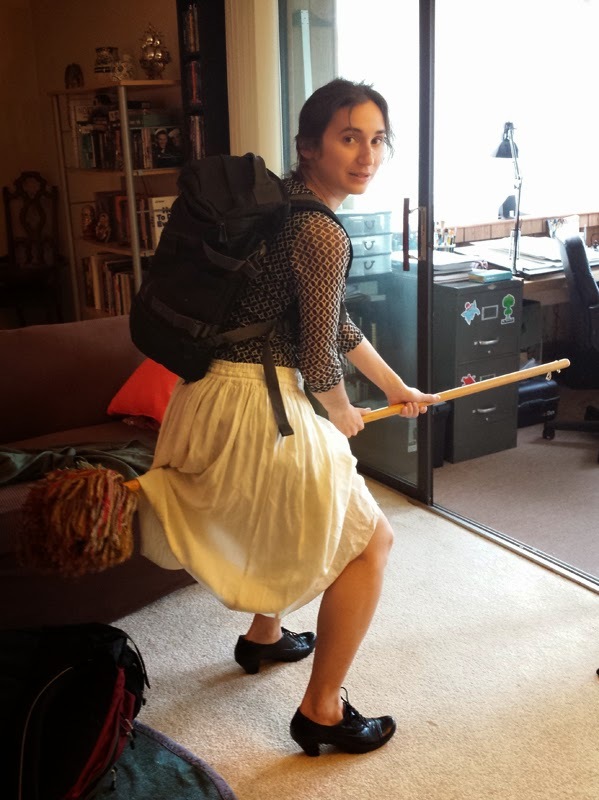 Luckily, my editor Leis knew that my readers would want something to tide them over until the next Baba Yaga book comes out, so I am also getting a contract to publish Pentacles and Pentimentos at last! They’re only going to put it out as an eBook to begin with, but if it does well enough, they’ll put it out in print too. (No pressure, eBook buyers!) AND, if it does really well, they’ll put out more books in that series too. I’m getting a THREE BOOK CONTRACT for the next three Baba Yaga books, plus a novella, and an additional smaller contract for Pentacles and Pentimentos. [They’ll be changing the name, but I don’t know what to yet.] And you all are getting a lot of new books over the next couple of years! I guess I’m going to have to come up with some way to celebrate, aren’t I? Any suggestions? Maybe another big giveaway? 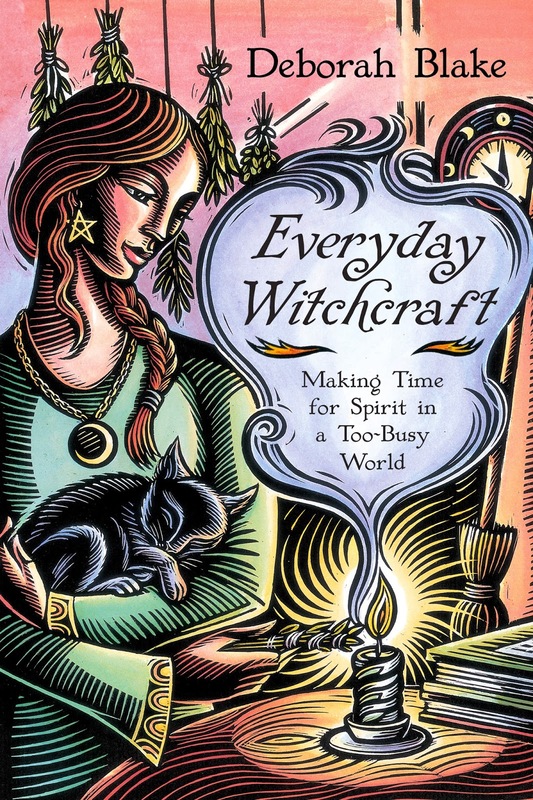 And, of course, I am still working on the tarot deck project for Llewellyn, and my next nonfiction book is coming out from Llewellyn on March 8th, which is only a couple of weeks away! I hope you’ll join me in doing the happy dance for this great news—because it would never have happened if it wasn’t for all the wonderful readers. Yes, the sky really was that color. Yes, that handsome guy is my dad. My fabulous parents. Sand. Shorts. Beach. In short, heaven. Any guesses which one of these arms belongs to the woman from upstate NY? Now that's a good-looking family. I hadn't seen my nephew in two and a half years. He got TALL. We had a great time--two days in a row at the ocean (which is my idea of heaven), my mom's homemade lasagna and apple pie, and laughing hysterically over a game of Apples to Apples. Then I got on yet another plane to San Jose, where I spent three and a half days attending Pantheacon, one of the largest Pagan conventions in the country. Which would be fabulous enough all by itself, but I also got to spend time with my beloved step-daughter Jenn, my incredible Llewellyn editor Elysia Gallo, and my insanely wonderful critique partner/all-around-great pal Lisa. Plus all sorts of cool Llewellyn authors and Pagan friends. Plus I got to finally meet the top dude at Llewellyn, Bill, who was a sweetie. That's Bill on the left. Posters on the wall of the Llewellyn suite. Gee, those two to the right look familiar. It was pretty tough to leave all that sun and warmth (and my kid) behind and come back to the chilly Northeast. Although of course, I was pretty darned happy to get back to my cats and my own bed. Did you miss me while I was gone? Maybe just a little? Don't wander off too far, because tomorrow (Wednesday) I'm going to have a Big Big Announcement. No, really, I mean it. BIG. HUGE BIG. In the meanwhile, I'm going to go to bed, because I have no idea what day it is or what time zone I'm in. Imbolc is a holiday full of contradictions. It celebrates the first stirrings of spring growth deep beneath the surface of the earth at a time when for many of us, winter is still in full force. And it celebrates the returning of the light when the dark still holds us firmly in its grip. But that is the point, really. Imbolc reminds us to look forward with hope, to look for the small signs that spring really is coming, slowly but surely, just as the light grows a tiny bit every day. If you go outside at night, you will notice that the sky seems different. The day dawns a few moments earlier and the sun sets a few moments later. There may be snow on the ground in many places, but deep below us, the earth IS stirring. For us, it is still the time of the darkness; time to plan, and set plans in motion, but not yet act on them. In short, it is time our to dream. Imbolc is the perfect day on which to create a dream pillow to hold those dreams safe as we take slow, careful steps to reach our goals. If you want, you can start by casting a ritual circle. Or if you don’t feel like being that formal, simply find a comfortable spot, settle in with your materials close at hand, and focus on your dreams and goals for the year. You will need: Either a piece of cloth or two pieces that can be sewn together to make a square about 2 inches on each side (the size can vary) or if you really don’t like to sew, you can use a drawstring bag. But the act of sewing is a good way to help focus the energy you put into the pillow. Bright colors are good, if they remind you of spring. A needle and thread (if you are doing this where the light will be dim, it is a good idea to thread the needle ahead of time). Small slips of paper and a pen. Something to stuff the pillow with. Optional—herbs that remind you of spring and/or help with dreaming, such as lavender. A white or yellow candle. You can start with the pillow already closed on three sides, so you only have to sew the last side shut after you’ve stuffed it. Light the candle and greet the gods in whichever way suits you. Take a few moments to think about what your dreams and goals are for the year, then write them down on the slips of paper. All your actions should be slow and thoughtful—don’t rush through this. Stuff the pillow with whatever else you are putting inside, then add the pieces of paper. You may want to say each goal out loud as you place it inside. Then tie a knot in the end of your thread, to cement your intentions. As you sew the last side of the pillow closed (or pull the string closed on your bag), you may want to say “to mote it be” as you place each stitch. Remember that the stronger your focus is, the more powerful the spell. When you have completed your pillow, you can say the following (from my book, Everyday Witch A to Z Spellbook, Llewellyn). If you want, you can sit for a while, envisioning your dreams coming true. Then thank the gods (open your circle if you have done a formal ritual) and tuck your pillow someplace safe, like your altar or inside your bed pillow. Magic the Cat living up to her name as she inspects our altar set-up for the ritual.